The Color Lab book giveaway! There’s a brand new, exciting book on the market and I have a brand new copy of it to give away. 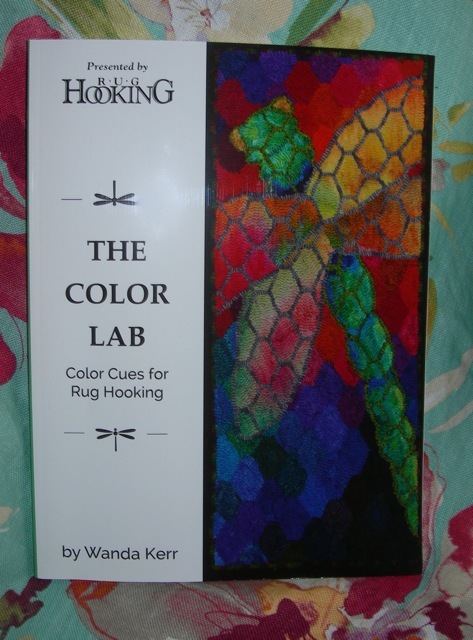 It’s Wanda Kerr’s book, The Color Lab – Color Cues for Rug Hooking [© 2018 Ampry Publishing LLC and Rug Hooking Magazine]. Wanda Kerr, a master colorist, shares her in-depth knowledge of contrast and depth, color temperature, saturation and glow, and color transitions. There’s a lot to know about color and Wanda’s book will help you with countless color photographs of her finished rugs and her color samples. Do you want to learn how to color plan your rugs? There are so many tips included here. This is a book that will become your go-to book for all things color. When to use warm color, cool color, how to transition between them, how to use a color wheel, etc. BOOK GIVEAWAY: To get your name in the drawing, please leave a comment on this blog post on my website. [Below this blog post is the teeny tiny word “comment/s”. Click on that to open a space to type your comment.] Be sure to sign in to leave your comment, so I will have your email address to contact you if you win. [Your email address will not be used for any other purpose]. The drawing will be held on Sunday, March 4th at Noon [EST]. I will announce the lucky winner in my blog on Monday, March 5, 2018. Good luck! There’s a lot of beauty out there and in the colors all around us.